The toolset also includes the Precision 1/8" Collet and the standard DeWalt 611 1/4" collet that comes with the spindle. If you have a different collet, make sure you just take the height and diameter measurements and input them into a new holder in the program - this will prevent any collisions (though Inventables has made it fairly foolproof by including set collars on all their bits - these are taken into account on the shaft specifications so you will have your tool lengths matched in reality and the program every time). If you are unsure which bit is which, the product links and item numbers are included in the tool info! 02.25.18: Updated V-Carve Bit Diameters to .245mm / .01"
03.04.18: Added Carving Bit Super Pack tools, edited feedrates to be slower and safer, adjusted 1/32" tools, applied consistent naming format and included collar colors for easy identification. Make sure to check your own feeds and speeds before cutting. They are currently set to some reasonable defaults (between 1000 - 1200 mm/min for 1/16 & 1/8 bits), and all using 16000 RPMs (#1 on DeWalt 611). I believe I selected all the available options for bits apart from maybe one or two during the order process, so a lot of people should find this useful to get programming their CAM stuff in F360 quickly. I hope someone else finds this useful! I hope someone else finds this useful! I think anyone starting with Fusion CAM should find it very useful. How does one load this into fusion360 ?? Just be sure to set your own feeds and speeds. I’ve set the feedrates reasonably so they can be used as a starting point for MDF, but you may want to drop down even more with the 1/32" bits since I don’t have much experience with them on anything other than extremely light material. Every one of the tools has a 16000 RPM set already, which is the #1 on the DeWalt 611. I’ve re-organized, added the bits from the Carving Bit Super Pack, edited a couple bits, lowered all the default feedrates to reasonable starting points, and also added the collar colors to the bit details so it’s easier to identify them. If you have the previous versions loaded in, I’d recommend removing them from your local library before adding this new set - things will get confusing otherwise. 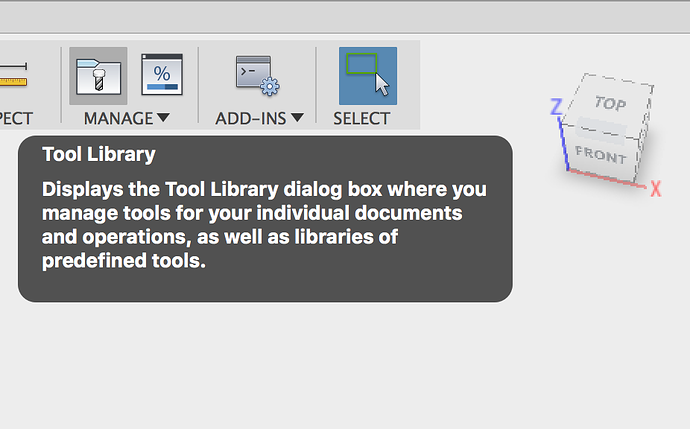 Removing tools from your local library will NOT affect your saved projects that used them previously, as they will be stored in a project-specific library. Can’t this work with VCarve Pro? Let us know if one of these imports successfully for anyone in the future who may have the same issue. These are great! 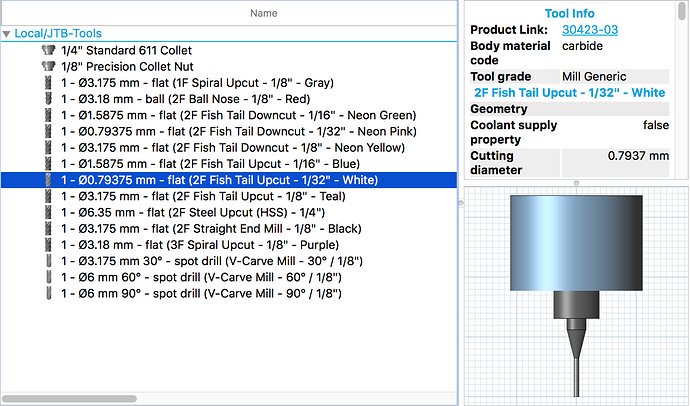 Anyone have the 1/4" V-carve bit toolset information I can enter into Fusion 360? Thanks. You, sir, are a king! I was sitting here with some calipers and my bits when I thought, “Surely someone has down this exercise already.” I cannot thank you enough! I especially like that you included the bit colors too. I’m just now getting into Fusion360 and there seems to be some unit weirdness when I import this file. 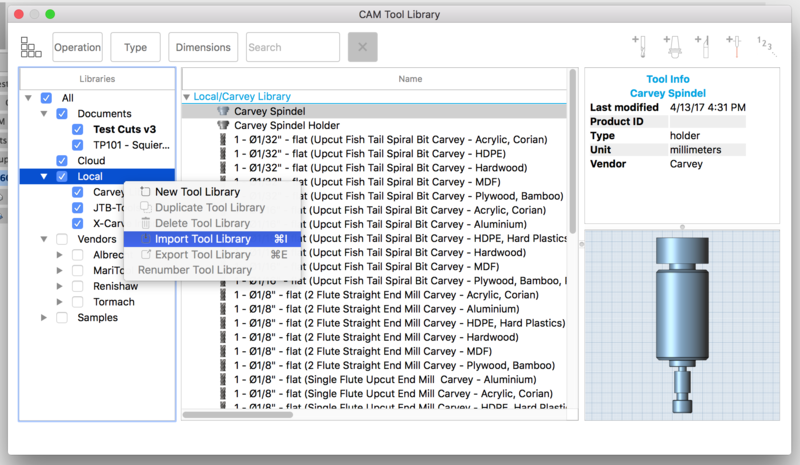 The Library screen which shows all the tools in a list shows inches (which I want), however, when I go to edit a specific tool, it’s all metric. How do I set up Fusion360 to show inches all around? Replying to myself. This was my bad. I didn’t realize there’s a drop down in the properties of each tool for units. I’ll simply switch them all to inches and save. how do I open the library link because Idk how to open it or what to use.